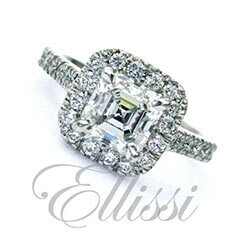 Home / Engagement rings: Custom Design / Radiant Cut / “Gloria” Radiant cut diamond in a diamond set band. 18ct white gold handmade solitaire ring set in four corner claws with one approximately 6.5mm x 5.3mm radiant cut Diamond of known weight 1.12ct GIA Colour F, Clarity IF. The ring is set down the sides in micro-claws with twelve approximately 1.8mm in diameter round brilliant cut Diamonds of total estimated weight 0.30ct (graded as; Colour: F, Clarity: VS) held on a 2.2mm wide half round shank. Weight: 3.8 grams.